We love Vincent Cassel. Never afraid to take on the meatier roles or try something different, Cassel is one of the finest actors currently plying their trade, and we will gladly fight anyone who disagrees (no punching in the face though, we’re not savages). 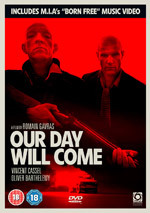 His latest effort, Romain Gavras’ Our Day Will Come (2011), is a film any discerning lady or gentleman should have in their collection, so luckily we have THREE DVD copies of the film to give away. Officially selected for the 2011 Edinburgh Film Festival, Our Day Will Come follows the story of red-headed teen Rémy (Olivier Barthélémy) who is bullied by his soccer team mates and drawn into fights with his younger sister and mother in their cramped apartment. After a flare-up of domestic violence, he flees home and is tracked down by his bitter guidance counsellor, Patrick (Vincent Cassel). Patrick looks upon Rémy’s sullen insolence with both sympathy and disdain and decides to toughen him up. The two realise that they are out of place in 21st century France; they have no country, no people and no army. Together they plot to take on the world in a hallucinatory quest for a land of imagined freedom. Who is Vincent Cassel married to? To enter, simply email your name, address and answer to leecassanell@cine-vue.com – with ‘Our Day’ in the subject line – to register ONE entry into the competition. To double your chance of winning, and for a SECOND entry into the competition just become a fan of CineVue on Facebook. Competition closes Wednesday 7 September, 2011.